Earliest Easter for nearly 100 years, and everyone's got Good Friday off including the cafe review team. Hold on, what's this, how's about we do the day before instead? Somewhere NOT in Felixstowe? Which is how we eventually found ourselves troughing a not very light Maundy Thursday lunch at the institution that is the Kesgrave Kitchen. As it happens, most days finds me cycling along the aptly named Main Road in Kesgrave. If the wind's in the wrong direction, I feel like I've had a fry-up as I'm passing the KK, emerging lightly Crisp-n-Dried on the other side. There's always a healthy selection of vehicles outside, often disgorging overall-ed men clutching a red top. Never actually been inside ... until today. Table had already been claimed by Grenvyle. Lesson one: don't waste your time trying to move your chair. Clamber in and stay put. Lesson two: you places your order at the counter, you pays the man, you sits down with your raffle number and you waits for your grub. Isn't all all day breakfasts here. There's jackets and even the odd salad, though I'd guess that's as popular a choice as the carrot sticks at McDonald's. Service was brisk: sausage good, egg a little greasy for my delicate constitution, and more chips than an IBM mainframe. 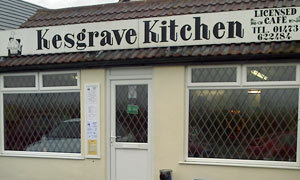 The Kesgrave Kitchen is licensed to fill. If it was a car -- Morris Minor Van. If they were passing by -- Leslie Grantham.